Tip of the day: Eating too much cheese could make it difficult to eat more cheese, so try not to eat too much cheese. 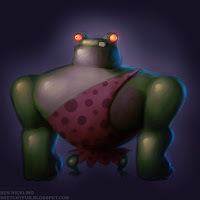 I participated in Bobby Chiu's Chiu-Stream again last night and this time around he was interviewing character designer and caricaturist Stephen Silver. It was a really great interview, with lots of good advice. That guy really knows his stuff. This time around, Stephen got to pick the theme for the 1-hour group sketch. He chose "cowboys". I was a bit worried at first, since my mind was drawing a blank as to what I could do for it. In the end I did what I always do in that situation; I just started doodling shapes until I begun to see something! 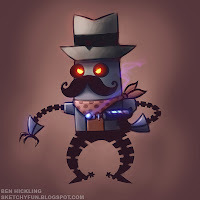 What I ended up with is a steam-powered (obviously, I mean, this is me we're talking about) robo-cowboy, complete with all-important moustache (also steam-powered). I woke up this morning, and to my surprise I saw a post on Twitter from Bobby Chiu saying I'd won! What the hell? I never win anything! Anyhoo, this post is far too long as it is, so here's the drawing! Flies are high in protein, apparently. Although I wouldn't recommend eating them..
Another sketch done for Bobby Chiu's live stream. 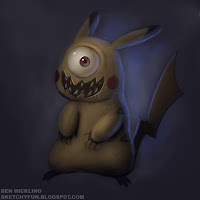 The theme of Bobby Chiu's latest live streaming session was "Evil Pikachu"